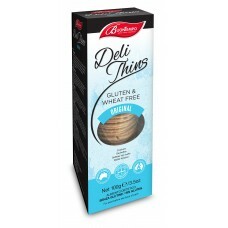 Buontempo Deli Thins Original are a light and crispy wafer cracker with a neutral flavour, perfect t..
A gluten free, fructose friendly, rich and soft textured cookie filled with white choc & dark ch..
Nutritional Information NET: 200g Serving per package: 8 Serving size: 25g .. 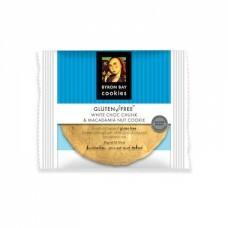 These Pretzels are delicious, and they are Gluten Free and Fructose Friendly Gratify Pretzels are..
Crispy, golden flakes of corn, sultanas, roasted almonds and natural red glacé cherries are t.. 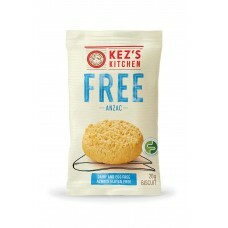 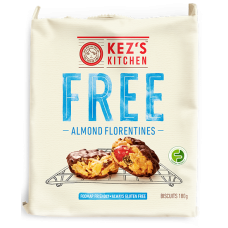 The Kez's Gluten & Dairy Free Anzac cookie is a gluten, dairy & egg free..
A perfect snack sized bag of bite-sized gluten free and FODMAP friendly choc honey crunch bikkies ma.. 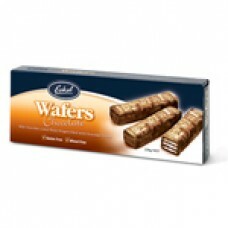 The Kez's Chocolate Chip is made with premium butter,eggs and a generous helping of couverture m..
SALE-BEST BEFORE 19.3.19 BAKED FLORENTINES 6 X 32G COOKIES This indulgent treat is made fro..
An Aussie biscuit icon lovingly made gluten and dairy free! 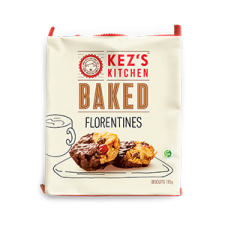 Our famous Melting Moments are two handm..